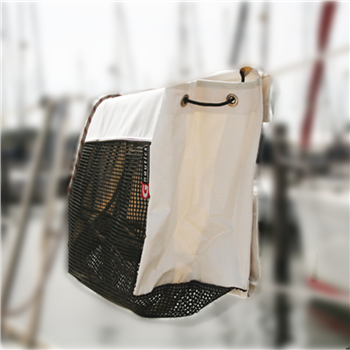 Tough White Acrylic halyard and sheet stowbag with breathable black mesh bottom, variable Velcro guardrail fixation. The stiff tubes on the top of the bags give good grip and opens the complete bag in one movement, while the elastic on the side panels close the bags directly so the ropes remains in the bag also in the roughest seas or in the hectic of a regatta. Holes in the reinforced back panels for easy bolt and nut assembly.